Trinity Episcopal Church in Abbeville was founded in 1842. Its congregation first worshiped in the courthouse before building a small clapboard building on the site of the present church in 1843. The congregation grew over the next several years, and in 1858 the church was ready for a larger, more elegant sanctuary. The congregation hired Columbia architect George Walker to design the building, which he did in the French Gothic style in honor of Abbeville’s namesake French township. Construction began in 1859, and the building was consecrated on November 4, 1860. Stuccoed to protect the porous, locally-made bricks, the church naturally casts a pink hue from the native clay lying beneath the exterior layer of cement. The steeple measures at 120 feet in height, not counting the gold cross that rests atop the spire. The interior of the church boasts the careful woodwork of local artisans, incorporating the graining style in fashion during the mid-to-late nineteenth century. The pipe organ was designed by John Baker of Charleston and is one of two remaining in South Carolina; the other Baker organ bellows from St. Mary Catholic Church in Edgefield. 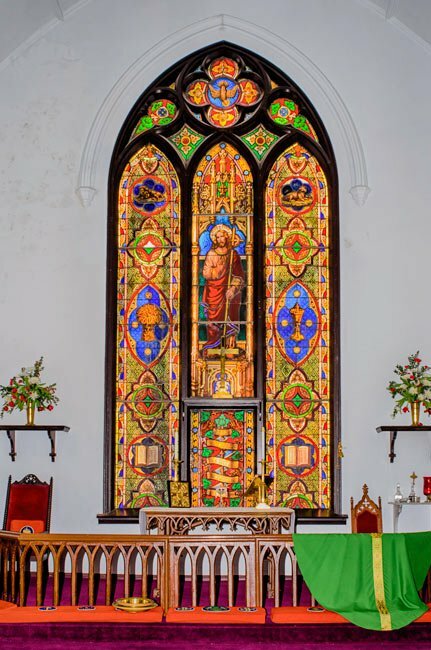 Decorative windows within Trinity include one of stenciled glass, a window presented by the children of the congregation many years ago known as the Children’s Window, and the noted altar window, seen above and below, which was a gift from another church in Greenville. The altar window arrived in 1863 after the English ship delivering the gift successfully ran a Union blockade. According to church lore, the window delivered was not the one ordered for the church, but during the height of the Civil War, returning the window was impractical. Therefore, the church wall was modified to accommodate the window. The church was spared from burning during the war, and even the bell, which was destined for use as artillery, was said to be of the wrong metal for weaponry. Thus, the original bell still hangs in the tower. Attendance at Trinity waned following World War I, and the church briefly closed in the 1940s, opening only for special serves such as weddings and funerals. 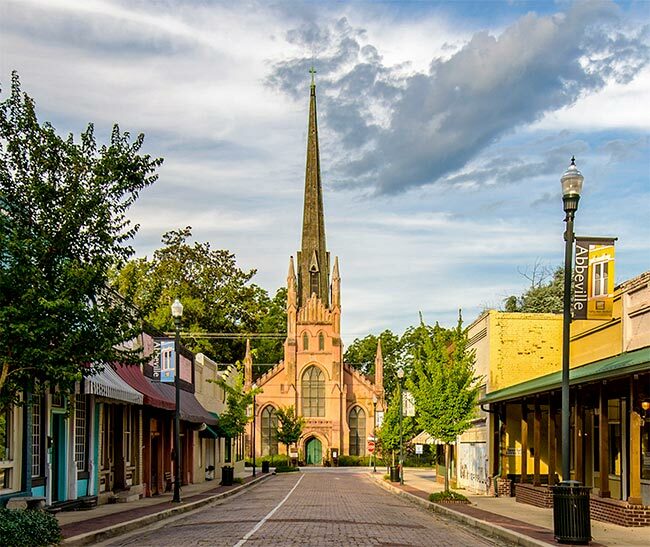 However, after World War II, Abbeville saw a population surge, and the church was reopened for regular service with a permanent priest in 1954. The historic churchyard is the final resting place of several Confederate soldiers and one Union soldier. 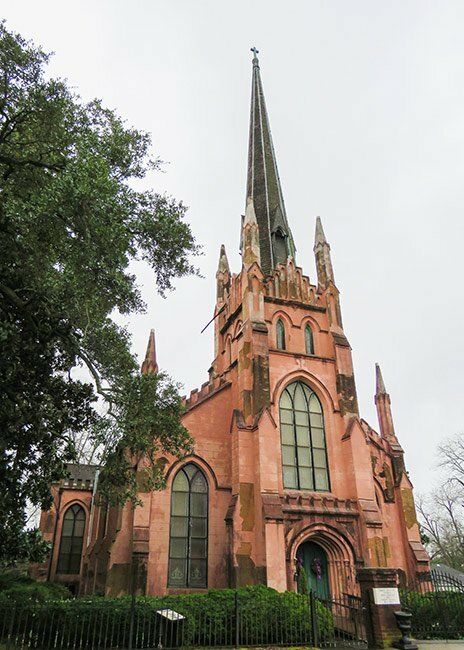 Trinity Episcopal Church is an example of Gothic Revival architecture in South Carolina that remains as originally constructed and contains handmade interior woodwork. Thomas Parker, Thomas Jackson and Thomas Walter Thomas organized the church in 1842. Bishop Thomas F. Davis consecrated the building in 1860, built after plans by George E. Walker, architect, of Columbia, and by Blease and Baxter, contractors, of Newberry. The solid walls are more than two feet thick, and are constructed of brick from an Abbeville brickyard. They are coated with cement that, over the years, has acquired a soft rose patina from the underlying native clay. The church’s spire is 130 feet tall and continues to dominate the local skyline. The organ, made by John Baker of Charleston, was installed soon after the church was built and is one of two such known organs in South Carolina. A magnificent stained glass altar window from England ran the Union blockades in the 1860s and was then carted to the upcountry. 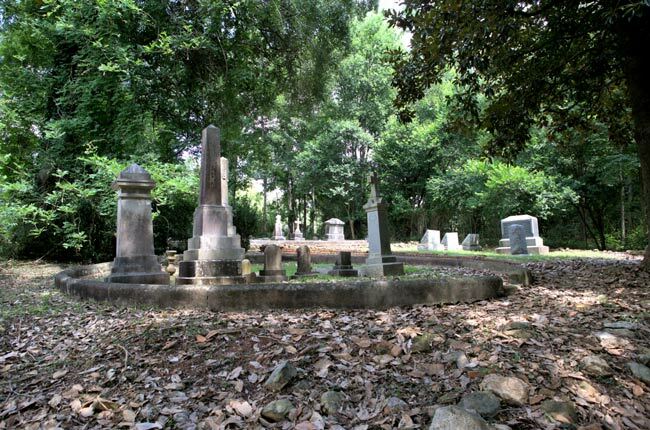 The churchyard and cemetery contain boxwood gardens, towering old magnolia trees and graves of church leaders. Great Church and Great Picture. 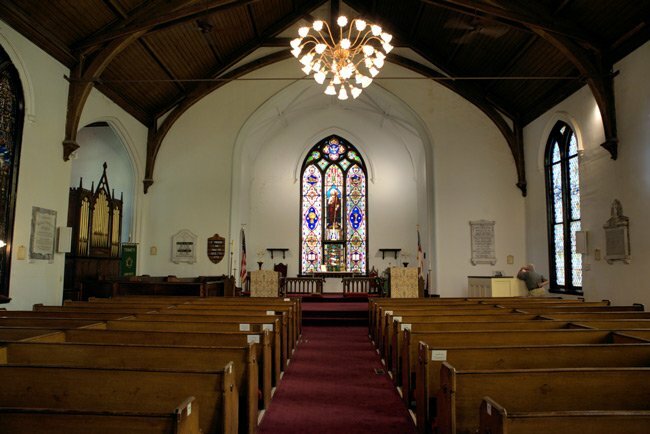 On Nov 7th at 2:00 pm Trinity will celebrate the 150th anniversay celebration of the consecration of Trinity’s historic church. Please join the congregation and Abbeville Citizens for this special day.